I would like to receive occasional information and updates from Clacton Rotary - Official Air Show Priority Parking 2016 and jumblebee. Orange car park is now closed. 1. A printed or electronic version of the ticket is required for entry. Tickets may not be copied or printed more than once. Each ticket is numbered and has a unique QR code. Entry will be refused for duplicate tickets. 2. 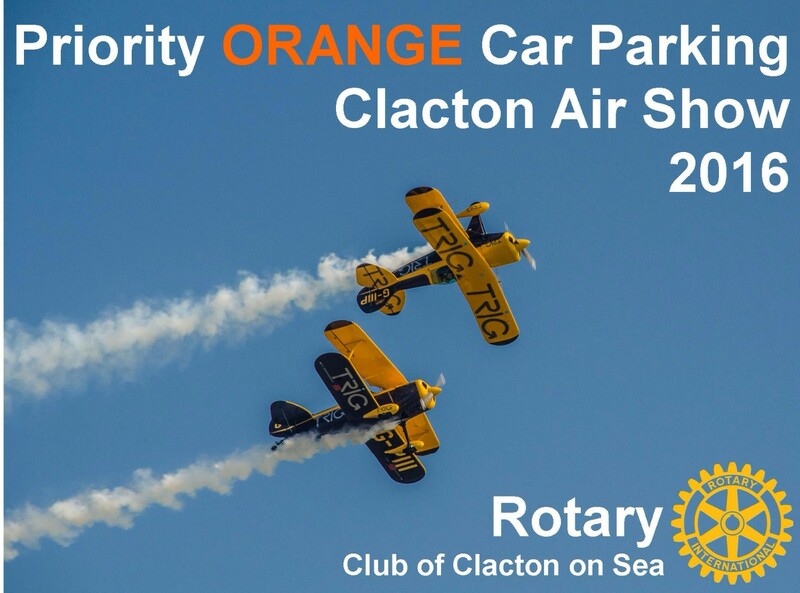 The Rotary Club Clacton on Sea reserves the right to refuse admission to the holder if, in the reasonable opinion of the promoter, the holder of the ticket might be a risk to the safety of other car park users or the running of the event. 3. Rotary Club Clacton on Sea does not accept responsibility for any loss, injury or damage to the holder or the holder’s property. 4. This is an outdoor event. Please come prepared for inclement weather. The event will go ahead come rain or shine. There are no refunds available for poor weather. 5. There are no vehicle re-admissions once leaving the car park. 6. Car parks maybe located on greenfield sites and the ground may be uneven. There may be temporary roadways and ramps. Please take care when walking on and off the roads and ramps or crossing them in wheelchairs or children’s buggies. 8. In the interest of fraud protection, no tickets will be replaced or ticket prices refunded if a ticket is forgotten, lost, stolen, defaced, damaged or otherwise unavailable. 9. There may be an administration charge/booking fee for the issue of the tickets; this is added to the transaction at the time of booking. 10. No tickets may be resold, used for competitions, promotions or hospitality packages without the written consent of the Rotary Club Clacton on Sea. Any tickets re-sold or transferred in such a manner will become voidable and the holder may be refused entry. 11. Ticket holders must comply with all directions given by event personnel and stewards whilst at the event. 12. Ticket holders consent to being filmed, photographed and recorded and understand that photographs, films or recordings of ticket holders may be broadcast, published, licensed or used in perpetuity (without payment). 13. Event attendees understand that the arrangements for the event may be affected by circumstances beyond the control of the organisers, which may result in the delay, postponement or cancellation of the event without notice. The Rotary Club Clacton on Sea has no influence or responsibility over the event and shall have no liability to ticket holders in respect of such delay, postponement or cancellation. All queries should be direct to the Air show organisers.